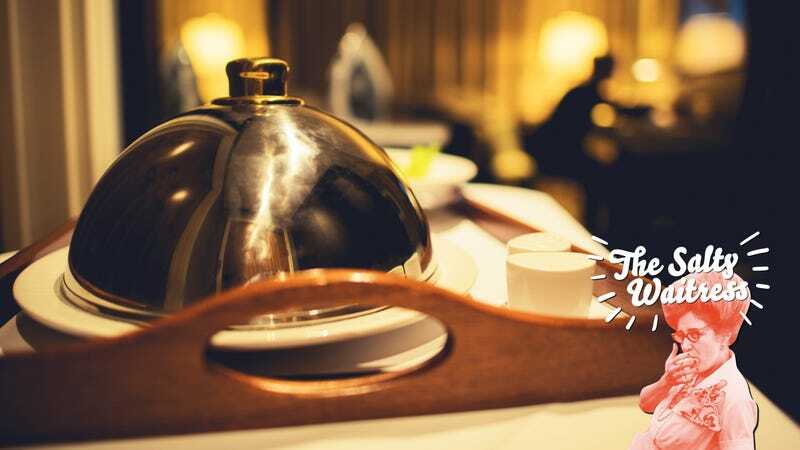 Ask The Salty Waitress: How much should I tip on hotel room service? Dear Salty, I travel a lot for business and recently got assigned to a client in a podunk town with hardly any non-fast-food restaurants. The last two trips there, I’ve just ended up ordering hotel room service because it’s easy and the food was pretty decent. I’m wondering how much I’m supposed to tip on room service delivery, though. Should I tip like a normal restaurant (20 percent) or like a pizza delivery where you just give the delivery guy a few bucks? My company’s dinner per diem is $40 so I usually end up ordering about that much food—should I tip $8 or just a few bucks in cash? I can see how this tipping situation could be tricky. On one hand, yeah, it’s food from the hotel’s restaurant delivered by a person who could be one of the restaurant servers, so you’d be inclined to tip the full 20 percent. On the other hand, all they did at most was take an elevator ride up to your room and ask you to sign a paper. Hardly full-service. My instinct says you should still tip 20 percent to compensate the staff person for the time it took not just to get the food to your room, but to prepare it for delivery, too. The server might get pulled off the dining room floor to pack up and deliver your tray, which is taking them away from tip-making tables there. But me, I personally never splurge on room service, so I wanted to reach out to some experts to make sure I had my ducks in a row on this one. Oh and hey whaddaya know, Miss Salty is right—as usual. “It is my understanding that tipping for room service would ordinarily follow the same protocol as for restaurants, approximately 20 percent.” That’s what Michael McCall, a Ph.D. and the NAMA Endowed Professor Of Hospitality Business at Michigan State University told me, and he seems like he’s got some credentials to back it up. McCall also told me though that people ordering room service should be sure to check the receipt to make sure there wasn’t already a gratuity added. Some hotels do already build that into room service these days, and he says you can just ask your room-service-delivery person if you want to know whether a service charge goes back to them as a tip. Etiquette expert Diane Gottsman of The Protocol School Of Texas told me basically the same thing as professor McCall: Tip 20 percent, or whatever you normally would at a restaurant. So there you have it: Salty and the experts agree, tip on delivery service like you would on a sit-down dinner—especially if your company is footing the bill. What’s the best-tasting supermarket brand coffee? Can I substitute one type of cream for another?